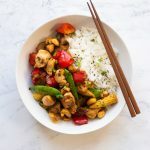 This Thai Cashew Chicken Stir-Fry is ideal for a quick and simple weeknight meal, packed with veggies, cashews and chicken it’s also super tasty too! Heat a wok over a medium heat. Dry fry the cashews for 1-2 minutes until they are golden brown. Keep a close eye on them to make sure they don’t burn! Remove the cashews from the wok into a bowl. Add the groundnut oil to the wok. If using dried chilli stir-fry it for 1-2 minutes in the oil to flavour the oil. Remove the chilli from the wok and add to the bowl with the cashews while leaving the oil in the pan. Turn the heat up to medium-high. If using the dried chilli flakes add them to the wok now alongside the garlic and chicken. Stir-fry everything together for 3-5 minutes until the chicken is golden brown and cooked through. Remove from the wok into a bowl. Add the onion and pepper to the wok and stir-fry for 3-4 minutes. Remove from the wok to a bowl. Stir-fry the mushrooms in the wok for 3-4 minutes until they have released most of their liquid and begin to take on colour. Remove from the wok to a bowl. Finally, add the baby sweetcorn and sugar-snap peas to the wok and stir-fry for 2-3 minutes, before adding all of the vegetables, chicken, chilli and cashews back to the pan. Add the oyster sauce and soy sauce to the pan and mix everything together. Cook for a further 1-2 minutes until everything is piping hot. Serve on top of rice or noodles and enjoy!